When you're welcomed into any family or organization, you come to appreciate its symbols and traditions. 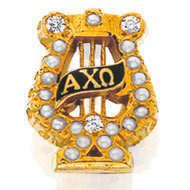 Some of Alpha Chi Omega's hallmarks, like our colors and lyre, are rooted in our founding. Others have been adopted and adapted through the decades. All have meaning to our members. They connect us acroos miles and years. They symbolize and verbalize who we are, where we've come from, and what matters most to us as individuals as an organization. Open Motto: Together let us seek the heights. Founders Day: October 15. Through acts of friendship. leadership. learning and service, we celebrate the birth of our fraternity. Traditionally, collegians and alumnae honor our founders on this day by serving their local communities, and by serving their local communities, and by celebrating the heritage and history of our organization. Hera Day: March 1. In honor of our patron goddess Hera, Alpha Chi Omegas give personal service for the happiness and well-being of others. Our remembrances include volunteering and fundraising for women's shelters in local communities, our chosen philanthropy. MacDowell Month: Febuary. Named for the MacDowell artists' colony in New Hampshire (Alpha Chi Omega's first philanthropic project), this month also honors our founders' heritage as musicians. During MacDowell Month, our members are encouraged to attend exhibitions, see plays, take in concerts, and otherwise celebrate and patronize the arts.